Whether you are a residential home owner or a business property owner there are ways you can possibly reduce your tax bill. Make sure you have the Veterans ($6,000) and/or Homestead ($20,000) Exemptions if available to you. There is also a Blind Exemption. Commercial business owners should check to see if they can lower their personal property tax bill by applying for the BETE which stands for Business Equipment Tax Exemption. Get a copy of your assessment card and check that all the information is correct such as number of baths, number of bedrooms, unfinished or finished basement, acreage, etc. Inform the assessor if your property’s condition changes or if you remove or tear down an old barn or shed. If your land has been professionally surveyed check to make sure the total acreage on your survey plan matches what is on your assessment card and tax map. If you currently receive two tax bills because you have two or more separately assessed parcels you may wish to consider merging them all to form one parcel for tax purposes. This will generally lower your taxes if they are contiguous to one another. The Business Equipment Tax Reimbursement Program (BETR) is designed to encourage new capital investment in Maine. The program reimburses local property taxes paid on most qualified business property. If you have information that will help prove the value is high please bring it to the assessor’s attention and if the assessor agrees you will receive a tax abatement. If the assessor disagrees you may appeal to the local Board of Assessment Review. If you are having trouble making your tax payments and can provide the City Council evidence of financial pressures you should apply for and may be granted a Hardship Abatement (sometimes referenced as a Poverty Abatement). The City Council will do everything possible to work with and help you to avoid foreclosure. The Maine Constitution says that property shall be assessed at its “just value.” The courts have interpreted “just value” to mean fair market value or in other words “what the property is worth.” A property’s worth is commonly looked at as “what a willing buyer would pay a willing seller” for a particular piece of property. Determining the market value of property is no easy task. Local assessors use three basic methods to determine a property’s worth. To find the value of any piece of property the assessor must first know what properties similar to it are selling for, what it would cost today to replace it, how much it takes to operate and keep it in repair, what rent it may earn, and many other dollar facts affecting its value, such as the current rate of interest charged for borrowing the money to buy or build properties like yours. Using these facts, the assessor can then go about finding the property’s value in three different ways. When using the sales comparison approach, the assessor must always consider such overpricing or under pricing and analyze many sales to arrive at a fair valuation of your property. Size, quality, condition, location, and time of sales are also important factors to consider. A second way to value your property is based on how much money it would take, at current material and labor costs, to replace your property with one similar. If your property is not new, the assessor must also determine how much it has depreciated. In addition, the assessor must also determine how much a lot like yours would be worth if vacant. The third way is to evaluate how much income your property would produce if it were rented as an apartment house, a store, or a factory. The assessor must consider operating expenses, taxes, insurance, maintenance costs, and the return most people would expect on your kind of property. One, two or all three of these methods might be used to help the assessor determine the fair market value of your property. It is also important to note that land and buildings are valued separately. Therefore, a home with water frontage may be assessed at a significantly higher value, because of the land’s value, than an identical home without water frontage. To implement the constitutional requirement that real estate be assessed at its “just value,” and in recognition of the tremendous difficulty and costs to a municipality to maintain a “just value” assessment, the Maine Legislature enacted assessing standards that municipalities must meet. One standard is that the total local valuation of taxable property not falls below 70% of fair market value. Another standard is that the quality ratings of assessments not exceed 20 (which basically mean that the difference in valuation between similar properties should never be greater than 20%). Why do assessed values change from year to year? When market value changes, naturally so does assessed value. For instance, if you were to add a garage to your home, the assessed value would increase. However, if your property is in poor repair, the assessed value would decrease. Both real (land and buildings) and personal property (tangible goods) are subject to taxation, unless they are exempted by law or subject to another form of taxation, such as the excise tax for motor vehicles and boats. The property tax bill for most Maine homeowners is based on the value of the land, the house, and the outbuildings. Local assessors are required by law to “ascertain as nearly as may be the nature, amount and value as of the first day of April of the real estate and personal property subject to be taxed . . .” This means that if on the 1st day of April you own property that is subject to taxation, then you are liable to pay those taxes to your municipality. Property taxes in Maine generate over $2.0 billion a year to fund local government services. Of the three major taxes – income, sales and property – used to fund Maine State and local governments, property taxes comprise the larger slice of the revenue pie. Property taxes generally account for 44% of the revenues in Maine generated by the three major taxes. The income taxes (corporate and personal) generate 30%, and the sales tax generates 26% of the total. Maine communities provide a vast array of services, including police and fire protection, winter and summer road maintenance, code enforcement, planning, economic and community development, issuance of licenses, recreation, parking, solid waste collection and disposal, water and sewer services, emergency medical services, health and human services, and sometimes more depending on where you live. Property taxes on average fund about 71% of the cost of local governments; the remainder comes mostly in the form of state assistance. How can I submit address changes or corrections? To submit an address change or correction, present a signed, written statement of the changes needed to the Assessor’s office or return the tear off portion of your tax bill with the noted changes. Was my Homestead Exemption applied to my bill? On the right side of your tax bill look for the “current billing information box”. If you received the Homestead Exemption you will see the amounts of $10,000 in the “Homestead” field. How is the mill rate (tax rate) determined? In calculating a property tax rate, the Ellsworth City Council determines the amount of revenue needed to be raised by the property tax to fund all of our municipal services. That amount is then divided by the total local assessed valuation to get the local tax rate. For example, a town that has a local assessed valuation of $100 million and needs to raise $2 million in property taxes will require a tax rate of 20 mills to do so ($2,000,000 divided by $100,000,000 equals .020). The assessor calculates how much must be raised in property taxes based on what the City Council has approved. A tax commitment listing all the property in town, its value and the taxes that are owed is then signed by the municipal officers and given to the tax collector who sends out the tax bills. In Ellsworth, property taxes are paid in two installments due in September and March. Property taxes may also be escrowed and payments made as part of a homeowner’s monthly mortgage payment. How Do I Reserve Harbor Park? Call or stop by City Hall or the Harbormaster’s office and pick up a Harbor Park Reservation application. The Harbormaster will let you know if your requested date is available and will go over the requirements for using the park with you. How Do I Get a Mooring in Ellsworth Harbor? Call or stop by the Harbormaster’s office and pick up a waiting list application. All waiting lists are updated in the spring. To remain on the list you must fill out an application every year. When an appropriately sized spot becomes available, we will notify you and send you a MOORING application. The City will rent you the spot, the Harbormaster will assign a location for you. You will then need to buy or build a mooring to City specifications and be responsible for setting and maintaining it. How Do I Reserve Dock or Slip Space? To reserve a dock or slip space in Ellsworth’s Harbor Marina, call or stop by the Harbormaster’s office during the week (May to October). Office hours are 8:00AM to 5:00PM Phone 207-667-6311. When can I use the library’s computers or Wifi? The Ellsworth Public Library’s WIFI is available 24/7 so use it with your laptop or Smartphone inside the library when it is open or outside. If you need to use a library computer you can just come in and sign on at an empty terminal with your library card and phone number or ask for a guest pass if you don’t have a card with us. People using our computers are limited to a total of one hour per day in thirty minute sessions. Can I access the library catalog and my account from another computer? You can access the Ellsworth Public Library Catalog online to search for an item, log in to your account, reserve, renew, send us a review of something you have read, or request that we buy something we don’t have. Anyone may obtain a library card at no charge. An item showing your current mailing address is required (piece of mail, utility bill, driver’s license, printed check.) Library members must show a current library card in order to borrow or renew materials. Hunting and fishing licenses can be purchased here at City Hall Monday – Friday 8:00 a.m. to 5:00 p.m. If you cannot purchase your license during these times, you can get one online anytime at the State of Maine Online Sportsman’s Electronic System — MOSES. How do I get a burning permit? Ellsworth residents may get a burning permit at the Ellsworth Fire Department any day from 7am-7 pm. The permittee must be the property owner or have written permission from the property owner, before obtaining the burning permit. The permittee should understand the restrictions stated on the burning permit. The permittee must have the valid burning permit in their possession while tending the fire and assure that no nuisance smoke is created. What are the guidelines for out-of-doors burning? When burning brush you should have at least 2 adults, hand tools such as shovel and rake, charged garden hose and/or buckets of water to control the fire. Brush piles should not exceed 10 cubic yards (Approximately 6ft x 6ft x 6) before starting the fire. When burning grass you should have at least 2 adults, brooms or other appropriate tools to suffocate a fire, charged garden hose and/or buckets of water to control the fire. When burning debris you should have at least 2 adults, hand tools such as shovel and rake, charged garden hose and/or buckets of water with to control the fire and the site should be inspected before the permit is issued. How do I know how much permit fees are? To find out permit fees, refer to the Permit Fee Schedule. What should I do if my keys are lost or stolen? Change or re-key whichever locks need to be changed for your protection. Notify the post office if your post office box key was taken. What should I do if my checks or credit cards are taken? Notify your bank or credit card company if you have not already done so, and have them changes the account number. Then call the three credit reporting bureaus to report the loss, and ask them to put a FRAUD ALERT on your account so NO NEW CREDIT will be issued without contacting you. This is especially important if any form of identification was also stolen at the same time. What should I do if my checks or credit cards are used? The merchant or bank where it was presented for payment must report the subsequent use of any of the stolen checks or credit cards to the police. Contact the banks and/or businesses that accepted your checks or cards to notify them of the fraudulent use. Encourage the banks and businesses to pursue charges against any suspect identified. Your bank or credit card company should have you sign an affidavit of check forgery or credit card fraud, and they should reverse all of the checks/charges relating to the fraudulent transactions. What should I do if my social security card is taken? Call the Social Security Administration FRAUD HOTLINE to notify them of the loss and get information on how to get a duplicate card. Also, notify the credit reporting bureaus listed above. Request a copy of a credit report a month or two after the theft to make sure no fraudulent accounts are being opened. What should I do if my drivers license is taken? Apply for a new Driver’s License as soon as possible and ask them if anyone has applied for a license since yours was stolen. They can refer you to an investigator. Also notify the credit reporting bureaus and request a credit report after one month. What should I do if my checks or drivers license is mailed to an address which isn’t mine? Call the U.S. Postal Inspectors about mail being falsely forwarded, and notify the credit reporting bureaus. What should I do if someone has stolen my identity to get credit? Call the police department and make an Identity Theft complaint. Also, call the Federal Trade Commission Identity Theft Hotline to notify them and get advise on how to proceed. Notify all three credit-reporting bureaus to put a Fraud Alert on your data and immediately request a credit report. You must then advise the credit bureau and the institution making the entry of any specific fraudulent accounts appearing on that report. That institution should send you an affidavit of account/transaction fraud to sign and return to them. What can I do to protect myself from being victimized? Don’t put your D.L. # or SS# on your checks. This makes it easy to get a false ID made. Keep all credit card receipts safe. Many criminals use numbers off receipts to defraud. Safeguard your PIN#s for all cards/accounts. Do NOT write them on or keep them with the cards. NEVER give your credit card number out to someone calling you. Make charges only when YOU call, and remember, Card Fraud Investigators will NEVER call and ask you for your credit card number and expiration date. How I do I Report a Sewer Emergency? If the emergency happens during working hours please call the Treatment plant at 207-667-7315 or if you fail to get a response please call City Hall at 207-667-2563 and dial extension 130. If the emergency is after hours please call the non emergency police number that is 207-667-2168 and the dispatcher will contact a member of the Sewer Department to respond. How do I know if Public Sewer is available for me to connect to at my property? If you would like to know if public sewer is available to your property for connection please call the treatment plant at 207-667-7315 and we would be pleased let you know your options. You can send your payment to City Hall through the mail. The address is 1 City Hall Plaza Ellsworth Maine 04605. Please make checks payable to the City of Ellsworth. How can I find my water or sewer bill? Print bill copies and look up bill balances for water and sewer bills on our Self Service Portal. When is Hancock County Planning Commission holding the next Household Hazardous Waste Collection? Ellsworth’s Household Hazardous Waste Collection event is held annually. For dates and more information, contact the Transfer Station at (207)667-1181. Why do I have to go to my town office for a permit before the Household Hazardous Waste Collection? Individual towns provide this opportunity for residents to dispose of unwanted household hazardous waste items and are financially responsible for the collection. Towns regulate the amount they spending through the permit process. The permit process also ensures that the town pays for its residents only. Towns enable you to dispose of certain limited quantities (2 units). If you have more than the limit amounts, the additional costs must come from you. Why does my Household Hazardous Waste Collection permit require that I have to have everything in a box? Speed, safety and cleanliness are the primary reasons. It is easier for the workers to grab a whole box rather than individual items. It is also safer for them to remove the boxed wastes from your vehicle if any of the items are leaking. Also, we do not want any of these items leaking into your car. We want you to be able to dispose of the items in a manner in which you and the community remain safe. After all, that is the purpose behind the collection in the first place. This depends on the type of battery. Regular household Batteries (AA, AAA, B, C, D, 9 volt) can be disposed of in your regular household garbage. They don’t contain heavy metals and are not considered hazardous material. Rechargeable batteries are accepted during the annual Household Hazardous Waste Collection. We encourage you to return batteries to the place where they were purchased for recycling (Radio Shack, Wal-Mart, etc.). Hancock County Planning Commission accepts them on a year-round basis. Car, lawn mower and boat batteries can be returned to the place where they were purchased or call One Steel Recycling at 947-3710. Should I bring latex paint to the Household Hazardous Waste Collection? No. Latex paint is not considered a hazardous material once it is completely dry. When it is in a liquid form there is the possibility of environmental contamination. To dry latex paint, open the can and allow the contents to dry out. To speed the process you can add kitty litter to the paint and the paint will be absorbed into the kitty litter. Once it is completely dry, it can be disposed of in your regular household garbage. Why can’t I throw my fluorescent light bulbs in the garbage? Fluorescent bulbs contain mercury and by law you cannot throw them into the waste stream. You can dispose of fluorescent light bulbs during our Household Hazardous Waste Collection. How can I dispose of thermostats containing mercury? Thermostats containing mercury can be brought to our annual Household Hazardous Waste Collection or contact Bangor Pipe and Supply at (20)667-5346 (55 Foster St., Ellsworth). Bangor Pipe and Supply participates in the Thermostat Recycling Corporation’s collection program and take them at no charge. How can I dispose of fuels and kerosene? Fuels and kerosene can be brought to our annual Household Hazardous Waste Collection in a gas can or similar container. Your container will be returned to you at the collection site. During other times of the year, it can be taken to The Environmental Depot in Lewiston. The Environmental Depot is open for All Maine resident household hazardous waste disposal. There is a $28 per “unit” fee. A unit consists of 5 gallons of liquid, 20 pounds of solid waste, or a combination of liquid and solid waste. The Depot is open the FIRST and THIRD Saturdays of each month from May through November. Hours are from 08:00 to 12:00. If the Saturday falls on a holiday weekend (such as Fourth of July), it will be CLOSED. Please be sure to conform their operating hours before traveling. Location: The Depot is located within the Lewiston Solid Waste facility at 424 River Road in Lewiston. Phone (207) 786-7390. From I-95, take Exit 80 (Southbound, take a LEFT off the ramp and go under the turnpike, Northbound take a RIGHT off the ramp). About 3/4 of a mile down, turn left on River Road (just after the WalMart Distribution Facility). Lewiston Solid Waste is about a half mile on the left. Proceed through the main gate by the scalehouse and around the main building. The Depot will be in front of you. How can I dispose of oil-based paint and paint thinners? Oil-based paint and paint thinners can be brought to our annual Household Hazardous Waste Collection. What hours are the Solid Waste Transfer Station and Recycling Center Open? What documents are needed to register my new vehicle in the office? What you will need to bring to City Hall to register your new vehicle depends on where your new vehicle was purchased, from whom it was purchased and what paperwork the seller or you have already completed. When in doubt, bring everything related to the new vehicle that you have (such as a blue Title application, green dealer’s certificate, proof of insurance, the window sticker aka Monroney Label, your prior registration, a bill of sale, prior owner’s title, Manufacturer’s Certificate of Origin, any lien holder information or lien release information). Based on your situation we will be able to determine if you complete the entire registration in our office or if you will need to complete the registration process at the Bureau of Motor Vehicle. Please feel free to call us at 669-6620 if you are not sure what to bring. What documents are needed to re-register my vehicle in the office? In most cases, you can do everything to re-register your vehicle in our office. However, if you are under suspension to operate a motor vehicle or are required by the State of Maine to file an SR-22 form, then you will not be able to complete the entire process at City Hall and you will have to go to Bureau of Motor Vehicles. How do I register my car or trailer online? Go to Rapid Renewal and follow the screen directions. This online service makes it possible for you to renew your motor vehicle registration and to pay your local excise tax in one simple transaction. You cannot register a vehicle for the first time online. Apply for a passport at the Ellsworth Post Office or Hancock Registry of Deeds. How do I file for divorce or get a copy of a divorce decree? To file for a divorce or request a copy of your divorce decree, you will need to contact the Clerk of Courts. How do I request a copy of a birth, death or marriage certificate? Picture Identification on the person requesting the document. If the document is not for yourself, proof of lineage to the person/people named on the record. $15 fee for the first copy and $6 for any additional copies at that time. 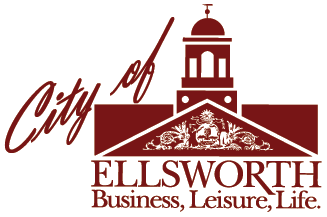 Residents of Ellsworth may register to vote at the City Clerk’s Office at City Hall during regular business hours. Proof of residency and proof of identity is required, such as a driver’s license indicating a physical street address in Ellsworth (not a post office box mailing address). If your driver’s license shows a previous address, please bring other documents (check book, utility bills, etc.) that show your Ellsworth address. For more information on the State of Maine regulations of Voter Eligibility, click here. If you are currently registered and wish to change any information, such as married name or residence address, that is pertinent to your voting record, please visit the Clerk’s office or mail the new information to City of Ellsworth, City Clerks Office, 1 City Hall Plaza, Ellsworth ME 04605. Currently, there are three official political parties within the State of Maine – Democrat, Green-Independent, and Republican. Registered voters may enroll in one of these three political parties. Voters who wish to register to vote do not have to select a political party. Voters can be registered to vote, but do not have to be enrolled in a political party. The employees in the City Clerk’s Office can not to answer questions for citizens regarding the purposes and objectives of the various political parties in Maine. What are the polling hours and locations? The municipal election is held on the Tuesday, following the first Monday, in the month of November. All positions are up for election during each municipal election. The State of Maine general and referendum elections are held annually on the Tuesday following the first Monday in November. The primary election is held on the 2nd Tuesday of June of each general election year. Residents of Ellsworth can register to vote at any of the Wards on Election Day. They must bring with them proof of physical residency in Ellsworth and proof of identity. Absentee Ballots must be turned in prior to 8:00 p.m. on Election Day to be counted. There are 4 polling place locations within the City of Ellsworth. Voters are required to vote at the appropriate polling place location for their ward. Please contact the City Clerk’s Office for the location of your ward. Ward One votes in the Upstairs Auditorium at Ellsworth City Hall, 1 City Hall Plaza, and covers the entire downtown area on the east of the Union River. Ward Two votes at Community of Christ Church, 283 State Street, between EBS and the Ellsworth High School. Ward Three votes in the Gymnasium at the Maine Coast Baptist Church, 867 Bangor Road, on Route 1A and covers north Ellsworth. Ward Four votes in the Council Chambers at Ellsworth City Hall, 1 City Hall Plaza, and covers the Bridge Hill area west of the Union River. If you are unable to vote at the polls on Election Day, you may obtain an absentee ballot. Absentee ballots are available at the City Clerk’s Office 30 days prior to the election. The absentee ballot may be voted at City Hall or mailed to the voter. The state law permits absentee ballots to be cast at any election by any voter who properly requests a ballot. If a voter is interested in voting in a particular election, but is unable to go to the polling place on Election Day, then the voter should obtain an absentee ballot. A voter may vote by absentee ballot at City Hall. Office hours are Monday through Friday, 8:00am – 5:00pm. Before each major election, the City Clerk’s Department also offers special hours for the purpose of correcting the voter’s list and conducting absentee voting. Please call first to verify the date and time. A voter may also call and request a ballot be sent by mail. Ballots are mailed on a daily basis. An immediate family member (on behalf of the voter) may, in writing, request a ballot be sent by mail or delivered to the voter by that family member. Applications for an absentee ballot may also be downloadable through this web site as an election draws near. If the ballot is returned by another immediate family member, the other immediate family member must also sign the application or written request indicating they returned the ballot. The family member must state his/her relationship to the voter. For more information see Absentee Ballot Request Service or Absentee Voting Guide (PDF). Make sure that nothing is running, such as the dishwasher, washing machine, faucets, etc. Check your water meter and if it is moving, then you may have a leak. If you find you have a leak, contact the water department. Where do I send payment for my water bill? Water bill payments can be mailed to 1 City Hall Plaza, Ellsworth, ME, 04605. Checks should be made payable to City of Ellsworth. How do I contact the water department after hours if there is an emergency? Contact the Ellsworth Police Department at 667-2168 and they will dispatch the Water Department.